Bring stylish entertainment into your home with this media base. Offering plenty of storage for movies and video games, as well as open shelving for your favorite media playing devices, this piece has exactly what you need to add the perfect centerpiece to your living room. The Colorado 58" Media Base by Winners Only at Gallery Furniture in the Oregon, Portland, Clackamas, Washington, Beaverton, Northwest, Vancouver area. Product availability may vary. Contact us for the most current availability on this product. Highlight classic mission style with the beautiful Colorado bedroom and entertainment collection. 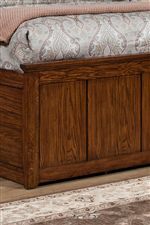 Pieces are crafted of hardwood solids, oak veneers, and cathedral grains with a warm Medium Oak finish for a rustic look. 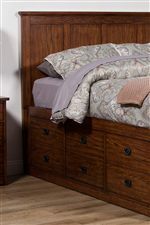 The collection features an abundance of storage options, including built in storage in the classic panel bed. Details like metal ring pulls, lattice fretwork, and simple lines solidify the group's rustic beauty. The Colorado collection is a great option if you are looking for Mission furniture in the Oregon, Portland, Clackamas, Washington, Beaverton, Northwest, Vancouver area. Browse other items in the Colorado collection from Gallery Furniture in the Oregon, Portland, Clackamas, Washington, Beaverton, Northwest, Vancouver area.